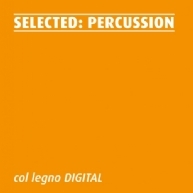 Our first thematic digital collection of music is dedicated to the world of percussive sounds: solo pieces, orchestra pieces with percussion, and percussive techniques on instruments usually not meant to be part of the percussion section. Caspar René Hirschfeld, „Die Handwerker“, from „Sommernachtsvariationen, op. 55“. To be found on the CD Wandlungen. John Cage, Second Construction, performed by Percussion Ensemble Mainz, conducted by Markus Hauke. More on Music for Percussion Quartet. First movement of Clemens Gadenstätter’s „Fluchten / Agorasonie 1“, recorded by Johanna Gröbner, Veronika Trisko and the ORF Radio Symhony Orchestra Vienna, led by Pascal Rophé. Listen to the whole Portrait-CD. Four well-prepared one-hand pianos play Ruedi Häusermann’s „Zur Unwucht“, a piece of jewellery from his „Wetterminiaturen“. Martin Grubinger & The Percussive Planet Ensemble perform Edgar Varèse’s „Ionisation“. This composition is to be found a second time on the CD Kontinent Varèse, as an interpretation of Ensemble Modern Orchestra. Quadrat:sch Extended featuring Zeen Parkins are part of our percussion sampler with their „Schnapper“. Listen to the full 2CD-set „Stubenmusic“. Helmut Lachenmann, Christian Dierstein, Lothar Zagrosek the State Orchestra Stuttgart: "Air". Part of the nice price CD "Orchestral Works". Edith Salmen perfroms Carlos Veerhoff’s „7 mal 1“, to be found on a chamber music CD. Once again, John Cage, this time with Markus Hinterhäuser: the sixth part of „The Perilous Night“, to be heared on the 2CD-set „Works for Prepared Piano“. Wolfgang Mitterer recruits three musicians for a unique performance. The result is a musical conversation about borderlands and sounds. Contemporary music meets jazz club! Sound as living, physiological phenomenon. Vol. I from our cooperation with the ensemble Platypus: "The Wild" – young, contemporary music!